Earlier this June, I was almost running out of money, only $20 in my pocket. But, my sun cream was not much left, I’d think how could I go through next days. That terrified me a lot; then, I had to seek a peaceful bargain between myself and this tough situation. Innisfree is always off the top of my head for safe choices at low budget. 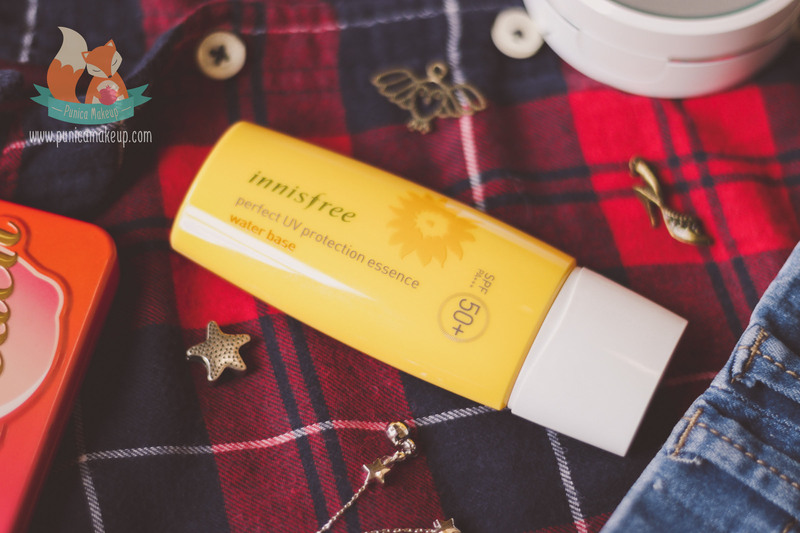 In this post, I’m gonna confess all of my candid thoughts in the review of Innisfree – Perfect UV Protection Essence Water Base SPF 50+ PA+++, which I guess one of my wisest decisions. My skin is not a type of easy to go along with any cosmetic products. I’ve been using the sun cream for more than 3 weeks and my skin isn’t disgruntled and doesn’t suffer negative reactions with it at all. The Innisfree Perfect UV Protection Essence Water Base SPF 50+/ PA+++ is infused with sunflower oil and green tea extract as main formula to defend skin from harmful UV rays. Moreover, it contains hydrating properties, including Hyaluronic Acid and Ceramide. Whether or not you’re in-the-know for this science, most of us might see these used in many beauty products without explanation or reason why we need them. So, I’m here to humbly help us to understand more the buzzwords. Gotta say we’re born with Hyaluronic Acid. According to 2015 study of New York Times, this is kinda a sugar molecule that can originate inherently within skin structure and connective tissues of our body. It works as a lubricating substance for our joints, hair, skin neurons and eyes. In terms of dermatology, its’ water-binding nature helps to lock your skin in moisture in long-run, approximately 6 litres of water held for one gram of Hyaluronic Acid. This ingredient tends to retain the emollient layer of your skin as well as combat dryness, dehydration, flakiness and wrinkles. Moisture deprivation is a pesky culprit that speeds up the aging process and result in flaccidity and sagginess. One more reason why we really need Hyaluronic Acid in sun cream is it’s clinically proven to alleviate sunburn. Similar to Hyaluronic Acid, Ceramide hydrates skin efficiently as well as dampens flakiness and aging spots. It’s a lipid molecule, theoretically including a fatty acid and sphingosine. The substance usually is found upon the outermost layer of epidermis (Stratum Corneum). It gathers skin cells and hence, forms protective barriers against harsh, environmental aggressions and bacterial invasion. Thus, ceramide is inclined to replenish skin’s loss of natural lipids caused by external factors. It can generate up to 40% of lipids, making skin plump and supple. Furthermore, ceramide is one of moisturizing ingredients that is able to prevent skin flare-ups in case of eczema. A 2008 research of the U.S. National Library of Medicine reveals that it can provide healing property over eczema. Ceramide can recover the skin’s defective barrier of eczema, which stems from destruction of intercellular lipids. Persons who wrestle with eczema are more likely to have a lower amount of ceramides onto the top layer of their skin than normal ones. The product also consists of common purslane, also well-known as Portulaca Oleracea. It’s a powerhouse of rejuvenating elements, omega 3 – fatty acids, vitamins E and C, glutathione, melatonin, beta-carotene and minerals. The World Health Organization states that this is one of the most-used plants in medication for its’ antioxidants, but also healing property and anti-inflammation. Additionally, the sun cream contains extract from Asiatic pennywort, also called Centella Asiatica as its’ botanical name. The herb is utilized for its’ accelerating recoverability of skin as well as connective tissues. 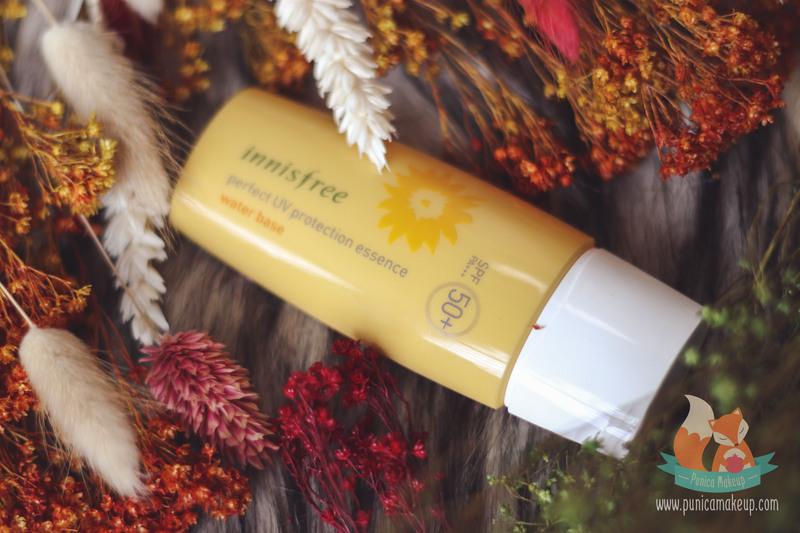 Last but not least, The Innisfree Perfect UV Protection Essence is made without tests on animals or animal ingredients, tar color, fragrance and mineral oil. The product is very watery; but not runny at all, looks quite similar to serum. Also, it has slightly yellowish undertone that doesn’t cause weird color onto skin. When gently spreading all over my face, it does give an extremely lightweight sense without coverage and brightening or whitening skin tone. Gotta say there aren’t any makeup effects in it, simply sun protection and my skin appear as wearing nothing. 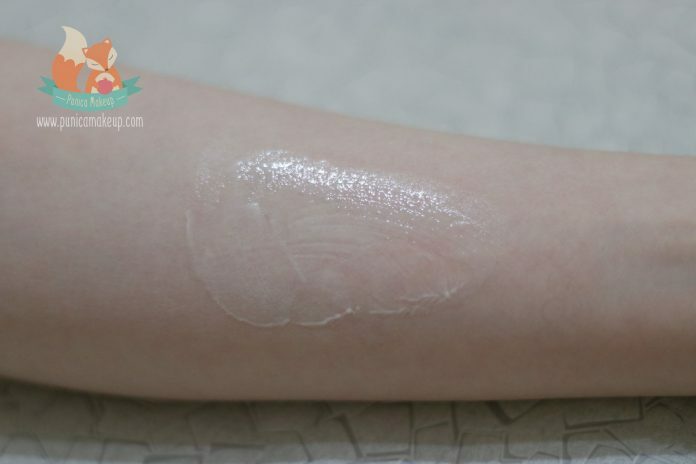 Nevertheless, it leaves a noticeably glowy, dewy look. The essence is easily blended out and quickly sinks down into texture. It’s like you’re using a normal moisturizer with very strong sun protection in it SPF 50+ PA+++. The essences’ hydrating property is not overwhelming; otherwise, really sufficient and comfortable to rescue my skin from tight and itchy feelings. My skin was previously drained out, getting many cracks and flakiness thorough the daytime. Unfortunately, my old sun cream couldn’t help much. At the moment, all of cracks, skin peeling and dry patches are visibly diminished. I really adore how my skin looks right now, healthy and radiant without dullness. I’d like to apply it alone in the morning, which is able to hydrate throughout the day. In cold, freezing weathers with low humidity like winter, I’d love to put moisturizing cream beneath the sun care for ultra-hydration. Of course, there are some concerns that we gotta notify about the product. It easily gets into my eyes, I feel really irritated, burned and hard to see. Thus, you need to be careful when applying around your eyes. However, that will be gone after few hours. Furthermore, the product lasts only for 6-7 hours and you should re-apply in the middle of day prior to sun exposure. It’s beautifully blendable so putting more layers won’t make any matters. One more thing, it’s not water resistant so don’t use it as sun protection in swimming. Speaking of the scent, it has sunflower smell, which is more calming than the Innisfree – Daily UV Protection Cream No Sebum I used last year. During three months ago, my skin was really horrible, freaking dry and flaky with severe redness, cracks and peeling skin. These used to be stubborn and irritated on my cheeks, forehead and chin. I wasted lots of money to try many moisturizers for this problem; however, it didn’t change a thing. That was really annoying and desperate to me, I had lack of confidence about myself. Eventually, I found out a good moisturizing cream to handle the dehydration pretty well at night. Otherwise, I was still struggling with the sun care in the morning. The sun cream I used before is the Juice Beauty Mineral Moisturizer Sheer SPF 30 that didn’t improve my complexion at all. Look at my skin right now, I’m very digging into my current sun care, which truthly brings about amazing changes I crave for. The Innisfree Perfect UV Protection Essence doesn’t make my face look odd by whole white consistency or cause patchy marks and streaks. In contrast, it gives refreshing and cooling sensations to skin with boosting hydration, my redness is gradually much better. I try testing the product while I’m having breakouts; absolutely NO clogging pores, NO aggravating cystic acne and NO upset bumps. I can tell this is non-comedogenic, my blemishes are naturally gone so NO need to worry by chances it would worsen your condition. Even though I do outdoor activities under hot weathers, the essence doesn’t cause terribly sweating or oily traces. You can feel free to put it under makeup, it doesn’t mess up or smudge your foundation. Actually, it may cause a bit greasy and wet feelings at first few minutes after applying on skin. But, that isn’t lingering at all, pleasantly it leaves a clean surface for an entire day. I can’t guarantee the product will definitely workout that way for all skin types. If you’re originally dealing with too much excessive sebum and severe acne, you should see doctors who are expert to consult about which sun creams proper for your situation. I’ll highly recommend this to normal, combination, sensitive and dry skin. 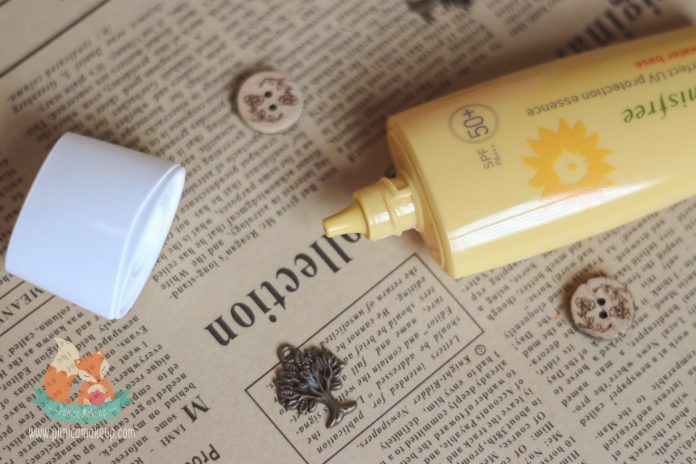 The essence simply comes into a handy plastic tube which is coated yellow color and decorated with sunflower image and clear information on it. The packaging is not easy to squeeze; however, very resilient, permanently retains its’ shape. I like how it’s designed with small head, the product inside can’t be spilled out or smear around the tube. Also, debris and dust don’t have any chances to creep in. The product is so great to deliver improvement toward my complexion and I’m really grateful for that. Besides, the price is affordable you can know more below and I think it’s definitely worth it. Then, I’ll give it 8 out of 10. This is my very personal review for Innisfree Perfect UV Protection Essence Water Base SPF 50+/PA+++. If you have any questions or suggestion about this, please let me know your thoughts. Don’t be hesitate to discuss more. Thank you so much for spending time with us.